Located in Maricopa county with a population of nearly 162,000 people, Tempe Arizona can be a hard place to find someone when the need to deliver legal documents arises. Process servers, such as ASAP Serve, can provide a simpler, more efficient, and more cost effective means to deliver court documentation under these circumstance. 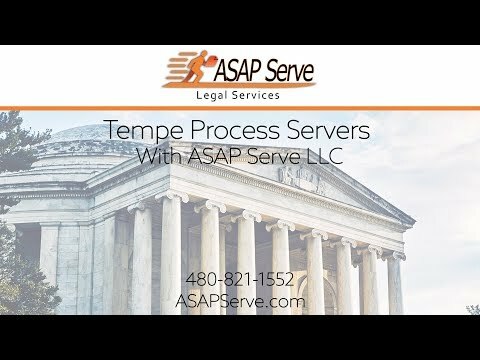 ASAP Serve’s certified process servers understand the jurisdictions, legalities, and the industry of process serving in Tempe Arizona. For process servers in Tempe near you, trust the fast and reliable experts at ASAP Serve to get your documents delivered on time! When you need your divorce decrees, child custody papers, and other important paperwork delivered, trust the process servers at ASAP Serve. At ASAP Serve, we provide excellent process servers for Attorneys who need court filings, summons, orders of protection, and much more! When you need documents served to the Arizona Prisons in Florence, Casa Grande, Phoenix, Goodyear, or Buckeye, ASAP Serve can get the job done right! Whether you are involved in any of these types of cases or any others that may require the serving of legal documents, ASAP Serve can ensure that these documents reach the proper people in a timely manner. Process servers are the most efficient and cost effective way of delivering court documents, allowing you to focus on other areas of concern. Every city has its own laws and regulations that a process server must abide by to ensure legal documents are delivered correctly and in a timely manner. ASAP Serve employes trained and certified process servers who are familiar with the specifics of the Tempe area. This allows ASAP Serve’s process servers to easily navigate within Tempe Arizona to deliver your legal documents, providing swift and efficient service at an affordable cost. ASAP Serve will also answer any questions that may arise while keeping you abreast of the status of your case. Failure to serve papers within the time frame established by the court can lead to frustration, additional costs, and an extended time table. This is why it’s important to work with experienced industry professionals, such as ASAP Serve, to get your legal documents served right the first time. The process servers at ASAP Serve are proud to provide servers who will deliver your documents to all of Tempe, Arizona. We distribute documents to areas including the areas of 85281, 85282, 85283 and 85284. Serving Downtown Tempe, Tempe Towne Lake, and the ASU College areas, ASAP Serve will get your documents delivered on time and as professionally as possible. Serving child support documents, divorce decrees and other family court matters, as well as serving documents to all prisons in Arizona, and much more! Trust the capable process servers at ASAP Serve.